“You’ll find it in lattes, smoothies, cookies, and even marshmallows—it’s one of the biggest food trends of the year, and it may just be the next hot superfood. We’re talking about matcha, green tea leaves that have been stone-ground into a fine powder. Japanese tea ceremonies have centered around its preparation and serving for centuries, and today it’s as easy as grabbing a cup from the corner coffee shop—and for good reason. Since you’re not just drinking the brewed tea but also eating the ground leaves, each cup packs in a ton of health benefits. One cup of matcha is the equivalent of 10 cups of green tea when it comes to nutritional content…not to mention it packs in six times the antioxidants of goji berries, 17 times that of blueberries, and 60 times that of spinach, holistic health coach Susan Reardon tells Boston.com. It boosts energy. Matcha is rich in the amino acid L-Theanine (it has five times as much as regular green tea), which stimulates alpha waves, helping us feel focused without jitters. Reaction time and performance on cognitively demanding tasks also improves, according to numerous studies. It cuts down on colds. The high levels of antioxidants in matcha boost your immune system and help your body fight off free radicals. It calms skin. The anti-inflammatory properties of matcha makes it a great addition to a homemade face mask. It may aid weight loss. Matcha contains EGCG, a catechin that promotes fat oxidation. And two cups will speed up your metabolism by four percent over 24 hours—it won’t replace healthy eating and exercise, but it’s an easy boost. It keeps teeth healthy. Smile! EGCG in tea inhibits bacteria from attaching to your gums and teeth, fighting plaque and cavities. 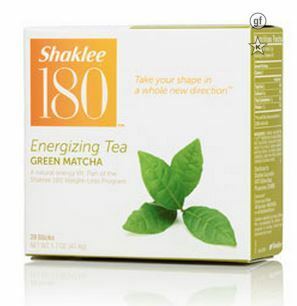 Going Matcha Green is easy with Shaklee 180 Energizing Tea sticks! Previous Previous post: What About A Shaklee Business?